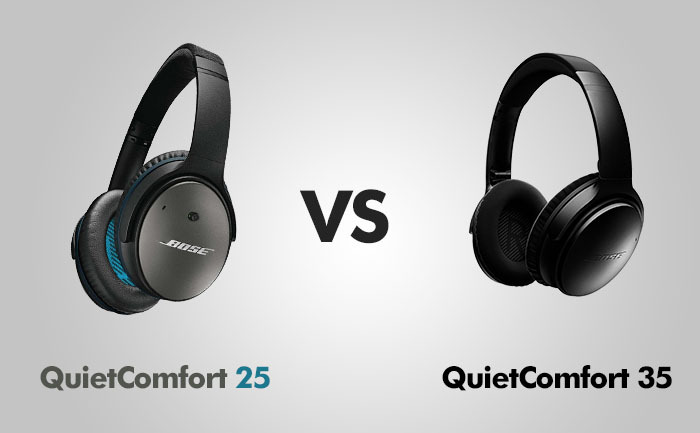 Bose QuietComfort 35 is a successor of QuietComfort 25 – noise-canceling headphones. At this point, you probably wonder how much QC 35 differs from the previous model. Is it worth to pay 50 dollars more for them? Let’s find out by analyzing the build quality, sound, connectivity, battery, and how good the noise canceling really is. The build quality of both models is very similar. They are made of plastic, to keep their weight low. They don’t put a lot of pressure on your head and the leather on the ear cups feels very premium and plush. There are some changes when it comes to the headband. Synthetic leather in QC 15 has been replaced by a nice suede called Alcantara, often found in luxury sports cars. While performing my stress test on the headband, it retains its shape. There are no strange noises, like squeaking and creaking, proving that we deal with high-quality materials. I appreciate the low profile and slimness of both models. It makes them look good whether you are on a walk or behind your desk. The earcups do a 90 degrees swivel, making them practically horizontal and easier to store in the hard shell case. Although both models are very similar, there is one big difference – QC 35 are Bluetooth headphones. For this feature, you will have to pay 50 dollars more. The downside of this is that there’s now a small rechargeable battery in them making these headphones a bit heavier. One of the biggest difference in both headphones is the location of controls. QC 25 are wired headphones, so you will find controls, like volume, play/pause, and microphone built into a cord. In QC 35, Bose moved the controls from the inline wire to the back of the right ear cup. Additionally, there is a light that indicates Bluetooth connectivity, and the micro-USB charging port. The wire is only attachable to the left ear cup. This can be a minor issue since competitors’ headsets can connect to either side. In the package, with the QC 35 headphones, you will also receive a 3.5-millimeter cord for a physical connection, basically turning QC 35 into QC 25. There is no locking mechanism, which is good because your headphones won’t fall off if you pull the cord too hard. The very name of these headphones suggests that they are both quiet and comfortable. As I mentioned earlier they are very light with the soft cushions and suede headband. They are very flexible and this is what makes them so comfortable. I have no doubt that most people won’t feel any fatigue on their crown or discomfort using these headphones, even after long gaming sessions. QC 25 weights 196 grams and QC 35 weights 235 grams. The sound quality of both models is pretty much exactly the same. It’s a good decent sound, similar in quality to other headphones in this price range. Where these headphones really shine, is their noise-canceling feature. The QuietComfort series is famous for is its noise canceling feature. It is probably the best in the market. 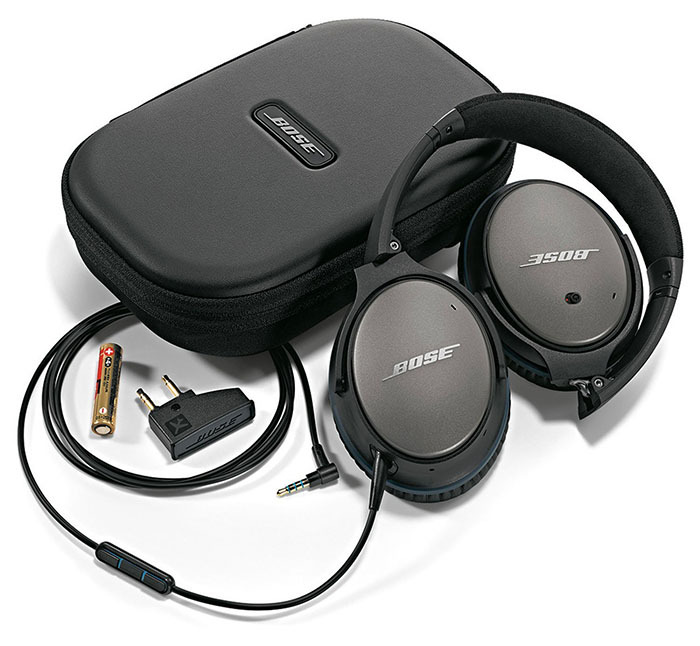 If you’ve heard the Bose noise-canceling headphones before, you know what I am talking about. I have never had the experience of such quality, when it comes to noise reduction, with any other headphones. Bose definitely rules in this segment. Noise-canceling won’t help with noises, such as crying baby, etc. They will help to reduce repetitive outside sounds, like air conditioners or airplanes. I think that they can reduce up to 80% of outside sounds. If you want to have this feature turned on, just flip the switch and this will reduce the outside noise instantly. I’ve tested them in public, around many people talking and most of the environment was muted. It’s simply amazing how great is the Bose algorithm when it comes to noise-canceling. The bass in both models is decent, but definitely not the best on the market. If you like to hear the lowest notes in the dubstep music, you should choose a different model. If you decide to buy QuietComfort, you can have a bit punchier bass by adding an amplifier. There is great detail in mids, they are very clear and crisp. The treble is detailed but not overpowering. If you flip the noise-canceling switch you will notice a bit of a difference in sound quality. In general, all levels of audio are well balanced, with clear vocals, without any of audio fields dominating. The soundstage is good. You can hear each instrument coming from different parts of the room. If you listen to a lot of hip-hop and rap, try these at a shop, there might just enough bass for you. Bluetooth is the biggest selling point over QC 25, which is just a wired pair of headphones. If you don’t want a wire dangling around, you have no choice but to buy the newer model. Pairing QC 35 with a smartphone or a laptop works flawlessly. Just turn on the headphones and choose the Bose headphones from the list. When you turn them on, a voice tells you what is the percentage of the current battery life. Because QC 35 is wireless, Bose decided to move controls, such as volume control and play/pause to the right ear cup. Despite being wired headphones, QC 25 still uses a battery, not to power the speakers, but for its noise-cancellation feature. The fully charged battery last for about 35 hours. The QC 35 battery has to power both noise-canceling and drivers. For that reason, it takes less time to fully deplete the battery. Bose says it’s about 20 hours. It’s still a lot of juice and it’s not very probable that you will listen to music all that time without an electrical socket in the vicinity. If you decide to use a 3.5-millimeter wire, instead of Bluetooth, that time will double. The time needed to fully charge the battery is about 2.5 hours. Every time you turn on your QC 35 headphones the speaker will mention the percentage of the battery left. PROS: Great noise cancelling / Volume controls and pause buttons on cord work beautifully / Comfortable / Good battery life / Alcantara material / Light / Compact / compatibile with iPhones / Compact case. PROS: Great noise cancelling / Comfortable / wireless / Great battery life / Alcantara material / Light / Compact / Minimal noise bleed. CONS: Wired only / Bass could be better / Requires an AAA battery. CONS: Bass could be better.